Stay active and eat right! Order your copy of Tufts' Eat Well and Exercise and you’ll have the information you need to stay active and independent for life. Now you can help put the brakes on aging by eating right and moving more! The nutrition experts at Tufts reveal how to stay active and independent for life. 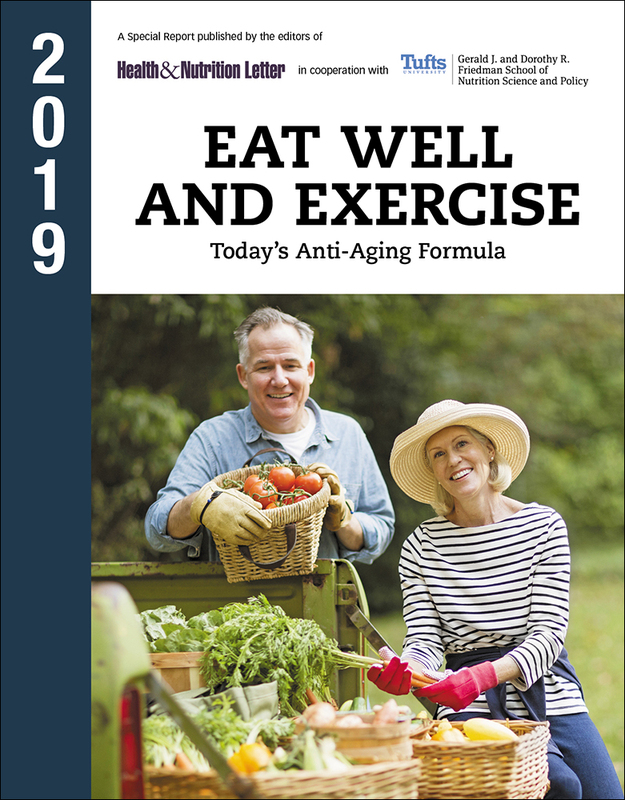 Order your copy of Eat Well And Exercise today! To help you live a healthy, active life, the editors of Tufts Health & Nutrition Letter created an all-new report called Eat Well and Exercise. This comprehensive report brings you all the latest research and findings on everything you need to know so you can enjoy all life has to offer. And that’s not all. You’ll find sample menus that show you how to get more nutrients from less food, 6 fruits and veggies that could help with weight control, 12 common pantry items that could ruin your health, healthy snacks that really help tide you over between meals, and so much more! Discover 2 of the most powerful Age-Fighting Secrets! Staying active and eating right are the best ways to fight disease and prevent the problems that can make you “feel old.” With Tufts’ Eat Well and Exercise you’ll have the information you need to stay active and independent for life. Eat Well And Exercise is available to you at the lowest price you’ll find anywhere. The cost is a very small price for information that can make such a large difference in your life or that of a loved one. Order today and if the report doesn’t match your expectations, let us know and we’ll fully refund your money, no questions asked. Now you can discover the secrets that can help you hold on to the vigor and vitality of your youth with this all-new report from the experts at Tufts Health & Nutrition Letter. So, come and get it! Send for your risk-free copy of Eat Well And Exercise today!